Israel's southern communities are bracing for what may prove further escalation in rocket fire, following Saturday and Sunday's surgical IAF strikes, which left three terrorists dead; but Colonel Tal Hermoni, the IDF's outgoing Gaza Division commander, is convinced that the benefits of the IDF's operations outweigh the danger. "If we wouldn’t be taking them out, the same terrorists would have infiltrated the border and killed 20 kids at a holiday party," he said Sunday. Hermoni marked his last day with the division Sunday, and attested to what he called "extremely difficult dilemmas" during his term. The last few rounds of escalation vis-à-vis Gaza's terror groups saw the IDF gearing for a limited ground operation in the Strip, he said. 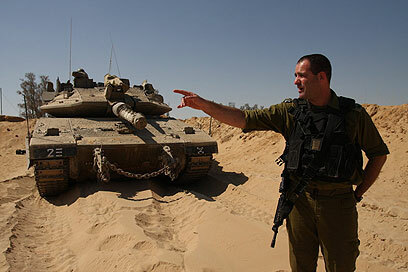 IDF forces in the Gaza sector have been on high alert since Operation Cast Lead, he added. "Not a day goes by here without projectile fire, or anti-tank fire, or infiltration attempts. We're like Kevlar and the proof is that the farmers here can work their land to the very last inch, new families arrive in these communities and kids can play outside after dark." The past summer has been one of the hottest noted in the sector. Commenting on the August terror attack which left 16 Egyptian border patrolmen dead and had a terror cell making its way to Israel in an armored personnel carrier, before being intercepted by an IDF force, he said: "We were given only a few moments' alert. It was a suicide cell – they all had explosive vests and they were ready to make contact." According to Hermoni, the prevented attack was designed to claim dozens of Israeli lives. 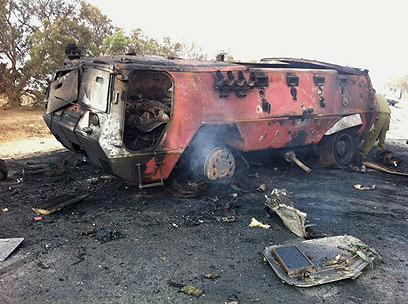 "The troops fired over 300 rounds on that APC and couldn’t breach it. "The terrorists then headed south by mistake, which gave us time to call in aircrafts and tanks." Hermoni believes that the Egyptians were complacent and that "This kind of thing could certainly happen again." He also points to the Philadelphi Route – a 14km road situated along the border between Gaza Strip and Egypt – as a potential source of trouble. "You can see the bulldozers trying to close off the smuggling tunnels. "On a tactical level, the relationship with Egypt's (sector) commander is good. The new fence is keeping the problems on the Egyptian side of the border." Despite the complex security situation on the Gaza border, the brazenness of the Strip's terror groups, the spike in Sinai terror and the rocket fire, Hermoni said that Hamas government is at least trying to assume some responsibility. "Hamas is taking action to prevent an escalation and is turning from a terror group to a sovereign movement that is assuming governmental responsibility. They have to worry about feeding and educating people, and every act of terror costs them dearly. "But they day the decision is made, we'll know how to bring it to its knees. There will be a (ground) operation in Gaza. The only question is when," he said. See all talkbacks "'Surgical strikes are worth risk of rocket fire'"